Northwestern University’s baseball stadium, now known as Rocky & Berenice Miller Park, has been the home of Wildcats baseball since 1943. 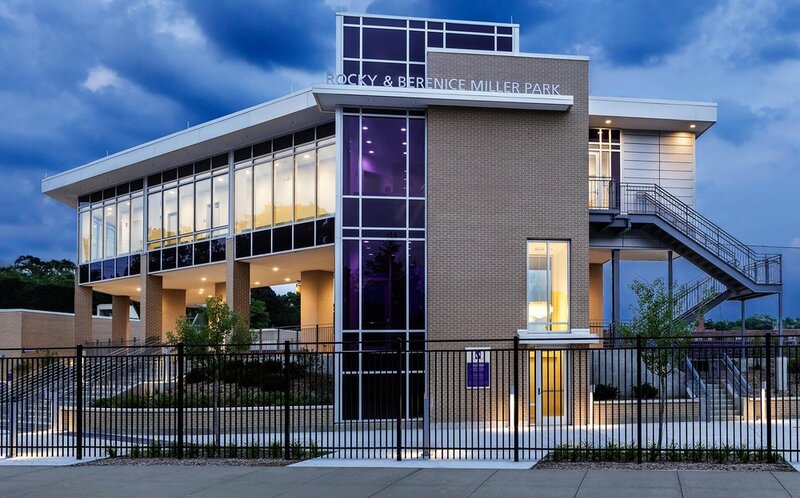 Thanks to a $5 million pledge from Richard and Roxy Pepper and university fundraising efforts, Rocky & Berenice Miller Park was transformed into a premier Big Ten athletic facility. The renovation was completed in two phases in order to accommodate the baseball season schedule. Phase one, completed prior to the 2015 season, included an artificial turf baseball field, pitcher’s mound, bullpens and new dugouts. Phase two, completed prior to the 2016 season, included a state-of-the-art clubhouse with locker room, players’ lounge, coaches’ offices, meeting room, training room, updated bleacher seating, concession stand and ticket booth. TERRA provided site and utility design for the entire facility. Rocky & Berenice Miller Park displaced existing surface detention infrastructure for NU’s Trienens Hall, so centralized stormwater detention was provided in the aggregate subbase of the turf field for both the park and Trienens Hall and permitted through the City of Evanston and MWRD. New water services were provided for each building as well as a new fire hydrant connection on the north side. Site pavements were designed to be ADA compliant and a sidewalk was added along Isabella Avenue on the north side of the site to accommodate pedestrian access from the community.